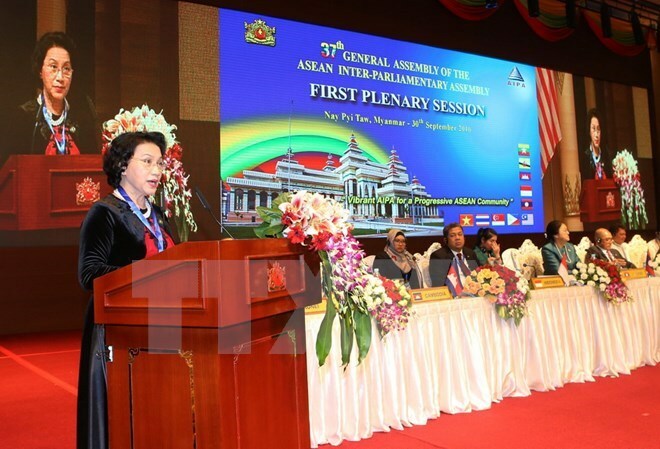 Nay Pyi Taw (VNA) – National Assembly Chairwoman Nguyen Thi Kim Ngan called for bringing the ASEAN Inter-Parliamentary Assembly (AIPA) forward on the back of the solid foundation it has built over the past four decades in her speech at the first plenary session of the 37th General Assembly of AIPA on September 30. Ngan said during the nearly 40 years of existence, AIPA has seen strong development, expanded its membership, strengthened its cooperation mechanism and closely backed the process of building an ASEAN Community. Expressing the Vietnamese NA’s support to the AIPA-37’s theme “Vibrant AIPA for a progressive ASEAN Community”, she emphasized that a vibrant AIPA is an AIPA of unity, democracy, law abidance and harmony, and mutual support. Vietnam will fully implement resolutions set by the AIPA 37. She reaffirmed Vietnam’s consistent external policy of independence, self-reliance, multilateralisation and diversification of ties; active, proactive and responsible engagement in regional and global issues; contributing to shaping and renewing AIPA’s activities, for a vibrant AIPA and a progressive ASEAN. The Vietnamese legislative leader proposed that AIPA would uphold principles and code of conduct of ASEAN and respect for international law for the sake of peace and security in the region while actively realising the ASEAN Vision 2025. The NA Chairwoman called attention to joint coordination in implementing the ASEAN Agenda on Sustainable Environment and Climate Change beyond 2015, promptly adopting and realising the Strategic Plan of Action on ASEAN Environment Cooperation for 2016-2025, as well as accelerating the Strategic Plan of Action on the ASEAN Development of Small and Medium-sized Enterprises (SMEs). She urged AIPA to push joint work in information technology in the region and the world so as to improve national capacity in the era of new technology. She called for more efforts to raise public awareness of benefits brought by ASEAN and the building of the ASEAN Community. AIPA in general and AIPA member parliaments should facilitate the implementation of the bloc’s legal agreements and actively supplement and fine-tune their domestic laws accordingly. On the occasion, she also lauded the outcomes of the ASEAN meetings, including the 49 th ASEAN Ministerial Meeting (AMM 49), which emphasized peaceful measures to address the East Sea issue, including respecting and abiding by international law, notably the 1982 United Nations Convention on the Law of the Sea, effectively carrying out the Declaration on the Conduct of Parties in the East Sea, and working towards an early formulation of a Code of Conduct in the East Sea.